In the 25th century humans have conquered space. The advent of faster-than-light travel has opened up hundreds of habitable planets for colonization, and humans have exploited the virtually limitless space and resources for hundreds of years with impunity. So complacent have they become with the overabundance that armed conflict is a thing of the past, and their machines of war are obsolete and decrepit. What would happen if they were suddenly threatened by a terrifying new enemy? Would humanity fold and surrender, or would they return to their evolutionary roots and meet force with force? One ship—and one captain—will soon be faced with this very choice. Against incredible odds, Jackson Wolfe is determined to save humanity–and in the process, might end up saving himself. I don’t usually read science fiction books – not very often anyway but I decided to pick this up earlier on this year when it was a kindle daily deal (those things are the death of me) but I haven’t read it. My partner has and he really enjoyed it so I figured I’d give it a go so I can see what all the fuss is about. Straight off I sense an unbelievable tension between the protagonist Jackson Wolfe and his CO Alyson Winters, it isn’t clear the reason why until later on in the book when things get explained more. To be perfectly honest I went into Warship thinking I wasn’t going to enjoy it as it really isn’t my sort of book, I know I know I shouldn’t have but what can you do? To begin with, Warship didn’t give me much hope at all. I spent the first 14% wondering when they were going to do something – the first 14% of this book was literally spent with The Blue Jacket (a raptor-class destroyer and the Warship in question) in the dock on Jericho Station and I was disappointed. I had hoped that it would be a bit more action packed than it was, and I very nearly gave up on it a few times because I just couldn’t get past the oodles of scientific mumbo jumbo and the fact that we were still in the dock. At the end of Chapter Three though, things started to improve and Warship was finally in the air! Or space rather considering. Jackson Wolfe is an Earther – he was born on Earth, raised on Earth and joined The Fleet from Earth rather than from a Terran system planet like most other Captains. 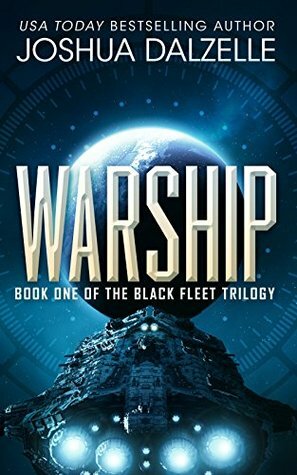 The whole “Black Fleet” system in this book is basically a bunch of really really old (over 40 years) ships that are not up-to-speed with current technology and are crewed by a bunch of misfits, ragabonds and people the higher-ups want to get rid of. There’s a lot of discrimination around Jackson Wolfe in this book – as an Earther he is considered less than the other Fleet Captains, add in the fact that his crew mostly hate him because he’s an Earther and the little drinking problem he has it’s not fun all round for Jackson at all. I feel for him I really do. His XO is changed just before he leaves the dock and he has to break in a new XO on what could quite possibly be his last mission. To top it off his orders change just as The Blue Jacket leaves Jericho Station – a legal aide for a higher-up is put on board the ship as a go-between for messages and it’s all very shifty. Jackson, however, appears to not care at all and I’ll give him his due – with all things considered he’s holding on quite well. I felt that the paragraphs were too long and there were minimal pauses in the sentences which made it seem to drag on quite a bit. Throughout their foray into space, time jumped quickly without so much as a by-your-leave such as jumping forward 3 or 4 days without mentioning why they jumped forward. It also had its fair share of philosophy to it: “Don’t let centuries of peace by lack of proximity fool you, Captain. We’re all still very human and thus lustful of what our neighbours have.” I quite liked that quote and thought it summed up parts of the human race nicely. I’m pretty sure you’re wondering what that means and without giving away too much of the story line – aliens invade. This 40-plus-year-old near de-commission warship took on an alien spaceship with advanced healing powers and survived. I find that incredibly hard to believe but it was a well written fire-fight. As some other reviews have said the book is pretty much four people sitting in the Bridge of the ship getting in and out of their chairs and having a wash occasionally. I found there to be lots of sitting around doing nothing exciting but it was written in such a way that you knew that this was how it was supposed to be. As much as I ended up enjoying Warship, I won’t be buying the second installment Call to Arms any time soon. Might pinch it off the boyfriend for a few days. There just wasn’t enough of the story to keep me entertained for a prolonged period unfortunately though it does deserve its four star rating.